Getting There: Airlines that service New Zealand from the U.S. generally fly in and out of Auckland. These include United Airlines, Qantas, and Air New Zealand. Flights between Auckland and the major cities of the South Island, including Queenstown and Nelson, are available through Air New Zealand and Ansett New Zealand. If you require a car while in New Zealand, it is recommended to reserve your rental before you go, in order to insure availability and the best rates. U.S. companies with offices in New Zealand include Hertz and Avis. See the Travel Info section for airline and auto rental Web links and 1-800 phone numbers. Staying There: Most visitors enjoy a couple of nights in the area of Auckland, New Zealand's largest city, before venturing to other areas of New Zealand. Devonport, a charming harbor town fifteen minutes by ferry from Auckland, is a good option for the Auckland area. There are a number of B&B establishments in the town, including the highly recommended, Villa Cambria, 71 Vauxhall Rd. (Phone: 09/445-7899; Fax: 09/446-0508). Bed & Breakfast accommodations are a good alternative in New Zealand due to the reasonable pricing, excellent breakfasts, and sound local advice available from the proprietors. Excellent lodging recommendations, as well as information on travel, restaurants, and sites is provided in Lonely Planet New Zealand. This and other guidebooks are available through the amazon.com ad link below. Fast Facts: The North Island (44,197 square mi.) and South Island (58,170 square mi.) are each roughly the size of England. 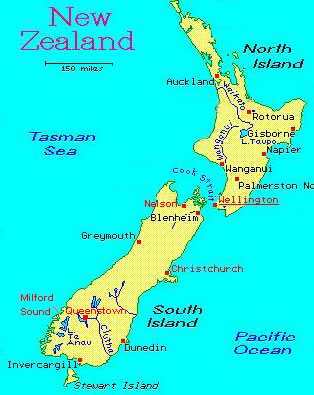 Roughly 70% of New Zealand's population of 3.6 million people live on the North Island. New Zealanders have a worldwide reputation for being hospitable and friendly ("except to their Aussie neighbors", we've heard locals say, tongue in cheek). The South Island is reknown for containing the broadest variety of natural treasures, although only the North Island has active volcanic sites. South Island is dominated by the Southern Alps, creating a wet climate on the west coast and drier conditions to the east due to predominantly western weather fronts. New Zealand's seasons are opposite those in the northern hemisphers, with climates spanning the range of those found between Los Angeles and Seattle in the United States. Except for winter sport destinations, the best time to visit New Zealand is during their summer months, December through April..The current exchange rate is approximately $NZ 1.85 to $1 U.S. Adventure Tours: The following information, including WWW links, is provided for those adventure tours covered in this article. Additional useful WWW sites for New Zealand travelers are also provided below. Fun Yaks Dart River Jet Boat/Canoe Tours: Full day tour includes pick-up from Queenstown lodging, transport to Glenorchy, all gear, jet boat journey up the Dart River, paddle down a portion of the river in inflatable canoes, and return to Queenstown. Queenstown Paragliding: Sign up for a jump through the Queenstown Information Network Office on Camp Street. Jumpers meet with a guide every hour at the Queenstown Gondola. Since jumps are only taken with selective weather conditions, they are not reserved in advance more than a day or two. Challenge Rafting's Kawarau River Raft Trips: Half-day tour includes round-trip transport from downtown Queenstown to the river, all gear, and two to three hours on the river. Fjordland Travel's Milford Sound Tours: A number of options are availble, all leaving from downtown Queenstown. Some options include luxury bus or back roads tour with ferry across lake and minibus through sheep stations, two-hour or overnight cruises on Milford Sound, and bus or air back to Queenstown. Ocean-River's Abel Tasman Kayaking and Hiking Tours: A number of tours or custom-designed itineraries are available. The full-day Golden Sands and Lagoons tour referenced in this article includes round-trip bus from Nelson to Maharau, all gear, round-trip water taxi from Maharau to Anchorage Bay, kayak paddling, lunch, and hiking as appropriate to conditions and tides.